Queen Bee of Tuscany (Farrar, Straus & Giroux, June 18) brings an extraordinary Victorian back to life. One of the most dynamic women of her day, Janet Ross was born into a distinguished intellectual family and raised among luminaries such as Dickens and Thackeray. At age eighteen she married and went to live in Egypt, where for six years she wrote for the London Times, hobnobbed with the developer of the Suez Canal, and humiliated pashas in horse races. In 1867 she moved to Florence, where she spent the remaining sixty years of her life, writing a series of books and entertaining a colorful miscellany of friends and neighbors, from Mark Twain to Bernard Berenson. Poggio Gherardo, her medieval castle in the hills above the city, became famous for its parties and delicious food, and she herself became the acknowledged doyenne of the Anglo-Florentine colony, as it was known. But she was also immersed in the rural life of Tuscany: an avid agriculturalist, she closely supervised the farms on her estate and the sharecroppers who worked them, often pitching in on grape and olive harvests. Spirited, erudite, down-to-earth, equally comfortable with peasants and princes, Ross was superbly many-sided, and her life serves as a window on a turbulent stretch of Italian history, from the Risorgimento to the rise of Fascism. Yet Queen Bee of Tuscany is the furthest thing from a sober academic study. Rather, it is a rollicking entertainment—brisk, anecdotal, and comic that also happens to be a panoramic portrait of an age, a family, and the English-speaking world’s evolving love affair with Tuscany. 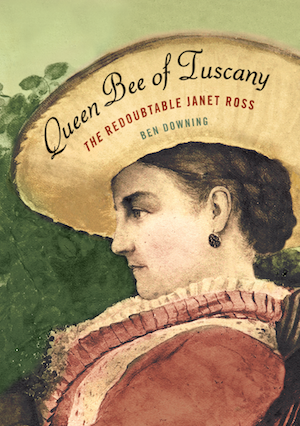 “Based on formidable research, Queen Bee of Tuscany always wears its learning lightly, and with style. Elegantly written, packed with anecdotes, it’s a real page-turner, and also slyly witty throughout. This is the best, the most informative, the most entertaining bedtime reading that’s come my way in a very long time.” —PETER GREEN, author of Alexander of Macedon, 356-323 B.C.